For over a year now, I’ve had this particular project in mind. I wanted an ornate frame surrounding our last initial set on burlap. The problem was, I couldn’t find a frame I liked. Every time I went to a store I checked the frame and wall art section. I did find a frame that would’ve been perfect at one home goods store, but it was over $100! I became a little frustrated and the search took a backseat. Recently I went to our local Walmart to check out Better Homes and Gardens’ new line of home products I saw featured in their magazine. Then, I found the perfect frame! It was a mirror, it was plastic, and it was $15! I stood there in the aisle admiring it from near, from afar, and I would not have known it was plastic had I not picked it up. Sold! I purchased the mirror and one yard of burlap from Walmart’s craft/fabric section for $2 and was on my way! 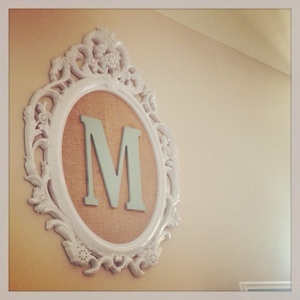 Next stop, Michael’s for a $2 wooden letter M.
All I did to make it was take the mirror out of the frame and wrap it with burlap. Then put the frame back together. 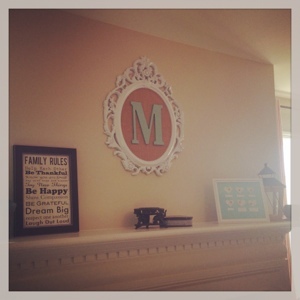 Next, my wonderful husband spray painted the letter M with Krylon’s Catalina Mist. Finally, I used hot glue to attach the letter. It was so affordable, easy, and exactly what I wanted! You can get the mirror here. You can get the burlap here. You can get a letter here. You can get Krylon’s Catalina Mist here. 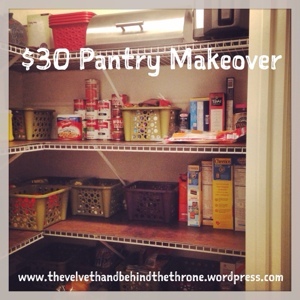 In a quest to organize every room in my home this spring, I decided to begin with my pantry. This “room” is used multiple times on a daily basis, making the chaos even more noticeable and bothersome. I had previously tried using baskets to combat the wire shelving and the fact that nothing sat evenly on them. I don’t have a before picture because I was so fed up with its current state that I had my husband empty everything out. This will give you a basic idea of the disarray. I finally did what I said I was going to do all along; peel and stick tiles. I originally saw the idea on Pinterest and have been talking about it since. I headed over to Lowe’s and found the peel and stick floor tiles. My eye was instantly drawn to the rust stained concrete look. 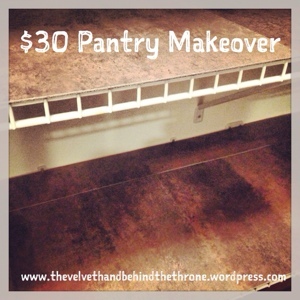 It goes well with our floors, cabinets, and countertops. I understand people won’t see them all the time, but it makes me feel better. 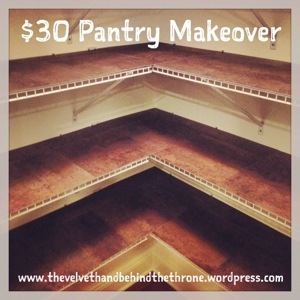 I was able to purchase all the tiles I needed for about $30! They are as easy as they seem. Just peel and stick! But at this point I have to thank my husband who spent hours, no joke, hours cutting and notching them to fit perfectly around the Closet Maid hardware. I volunteered him to help with this project and it did end up being a little lot more involved than we anticipated. Here’s what they looked like once installed. 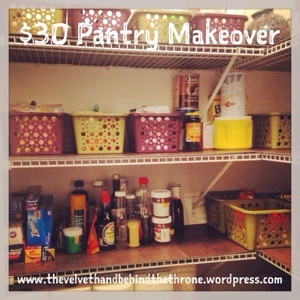 And here’s how the pantry looks now that we are no longer wasting space and relegating everything to baskets. I am still using them for the littles’ individual snacks, K Cups, and spices though. I’ve really taken to small crochet projects lately. I like them because they give you an almost instant gratification. I found this pattern on Pinterest and decided to give it a shot. While it didn’t turn out 100% the way I would have wanted it to (I forgot to switch to the brown on the front panel for the outer edge and ears), I think it’s pretty cute, and my littles do too. What are your favorite quick projects? 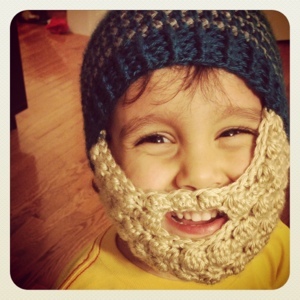 My post about the bearded beanie is linked up over at A Bowl Full of Lemons. 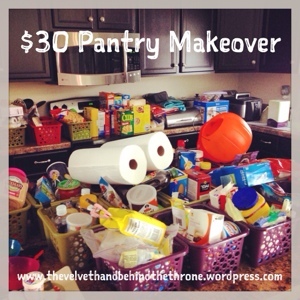 Head over to check out all the other inspiration on crafting, cooking, cleaning, and organizing! I am so excited about my most recent crochet project! So much so that I even mentioned it in the previous post about the new year. I wish I could say the same for my son though. 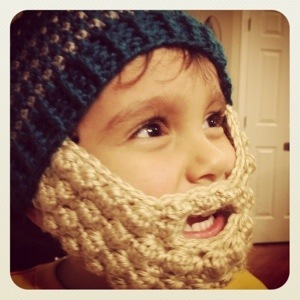 I found an easy to follow pattern for this incredible bearded beanie here while browsing Pinterest. My son loves the fact that my husband has a beard and he always talks about how Grandpa has a mustache, so I really thought he would be thrilled to wear this hat and have his own beard and mustache. Both the beanie and the beard were very quick projects and I was so excited to see him in it that I stayed up until about 12:30 one night to stitch them together in order for him to wear it the next day. Cue the screaming toddler. My husband put the hat on him and showed him his reflection in the mirror and that was it. He won’t wear it again. If I try to get it on him to take a picture, he rips it off as quickly as his chubby, little, toddler fingers can! Head over to Toni’s blog and check out all of the wonderful projects and be sure to check out the link to my Bullet Journal post! 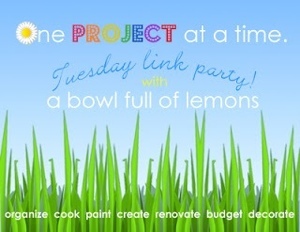 Just click the button below to check out the link party! Hi everyone! Remember me? It has been a long time since my last post, July to be exact. Things were crazy over the last half of 2013. School ramped back up in August so I returned to work, I interviewed for new jobs (and got hired), I resigned from my current position, we celebrated my daughter’s first Halloween, Thanksgiving, and Christmas, worked on potty training with my son, and my Thirty One business really picked up. It was hard for me to carve out any free time for blogging. But blogging makes me happy and I resolved to make it a regular part of my life again. It gives me the opportunity to share things that are important to me with you. Because it’s a new year and everyone gets a fresh start, I’m working on becoming more organized in order to be able to write more. One way that I’m doing that is with a Bullet Journal and I’m excited to share it with you! 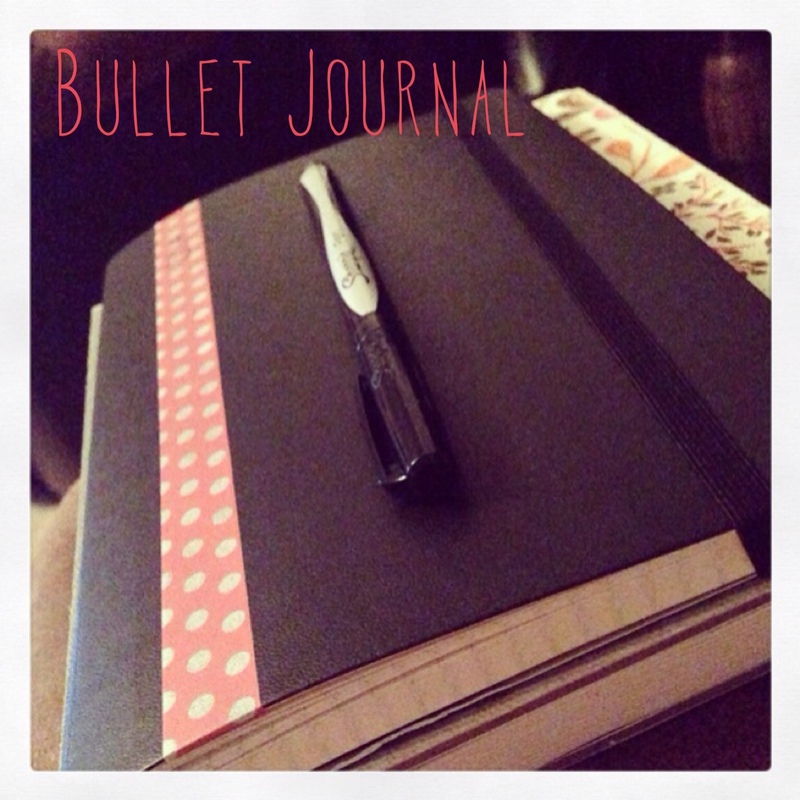 The Bullet Journal is a concept developed by Ryder Carroll and you can find his tutorial here. I first found the concept on Pinterest and knew instantly it was for me. I am a chronic list maker and prefer a paper and pencil planner over a digital planner or app. I would give you detailed rundown of how to use one, but I don’t think I would do it justice. Ryder’s videos and websites are wonderful. The basic concept is this; the Bullet Journal is a rapid logging system to help you keep track of tasks, events, and notes throughout your day. On his website, you can get more information about how to format your monthly calendar and daily pages. I will say that one thing that was missing for me, was a way to log future or upcoming events. Using Ryder’s system, you only have one monthly calendar written out at a time, but I like to plan ahead. For instance, I already know of an important meeting and a dog grooming appointment in February and a doctor’s appointment for my littlest in April. I solved that problem by creating a spread after my index that lists all the upcoming months in columns. I numbered down the side of the page like the monthly calendar and when I have a future event, I write the page number on which I made a note about the upcoming event. That way when I make the monthly calendar pages throughout the year, I can refer to this year-at-a-glance spread and go to the page numbers listed to find all of the details about the events I need to include for any month. I’ve already included numerous tasks related to my blog to help me get back into the swing of things. 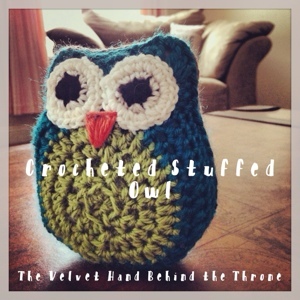 I’m currently working on perhaps the most awesome crochet project that ever was and I’m chomping at the bit to share it! I’ll also be sure to update you on how the Bullet Journal is working for me in a few months to see if it’s something sustainable. 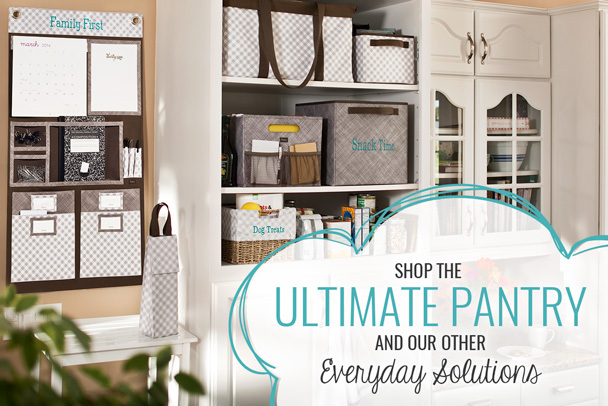 My Thirty One Page Awesome products that can help you to organize your life and home!